When there are many windows open on desktop of Windows 7, normally users will click on another window in order activate the window into front or foreground and switch to the task or window. 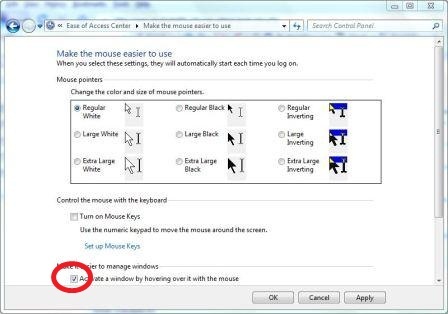 Some users may prefer to be able to switch to another window immediately upon mouse over or hover the mouse pointer on the inactive window. Microsoft provides such auto-bring to front window on mouse over option in Windows 7. Click on Ease of Access link or Ease of Access Center icon. Select Change how your mouse works or Make the mouse easier to use option. Tick the check box for Activate a window by hovering over it with the mouse under “Make it easier to manage windows” section. Click OK or Apply, and hover your mouse on another window to activate it instantly. Actually, the feature is meant for user with disabilities to make it simpler to use Windows. Thus, normal users may feel uncomfortable or even mistakenly move the mouse away to activate the wrong window when still want to stay working on current application. Thus, use with care.